Someone Bought This: WCW Talking Sting Mug - WrestleCrap - The Very Worst of Pro Wrestling! 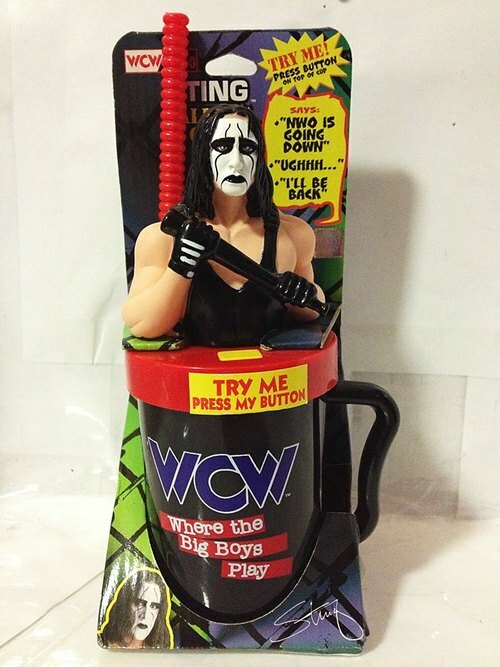 Bryan (who runs the awesome WCW Worldwide blog) found this goofy WCW Talking Sting Mug (?!). 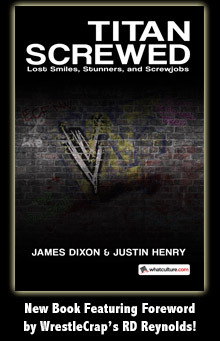 Featuring classic Stinger quips like “UGHHH…” and “I’ll be back”!! Yeah, that just about sums it up. I guess when Sting isn’t threatening the NWO, or constipated, he’s impersonating Arnold Schwarzenegger? This is one of those things that’s so dumb that I’d be embarrassed to be seen using just about anywhere. I do not need to hear Sting every time I take a sip of my Swiss Miss hot cocoa! 6 Responses to "Someone Bought This: WCW Talking Sting Mug"
The best part is a talking Missy Hyatt cup would say just about the same things. Maybe ohhhh instead of ughhh unless she’s referring to Scott Putski. Kind of defeats the purpose of the dark, brooding, silent Sting. He really didn’t start speaking until he joined nWo Wolfpac. I’m surprised his most famous phrase: “It’s showtime!! !” wasn’t included. He’s sad because the royalties check from this wasn’t big enough to cover the wound of having agreed to it in the first place. Sting make sad face because the straw is bigger than his bat. They really missed out on making an Austin talking beer mug.